BOSTON, MA–(Marketwire – Jul 22, 2011) – Skycore LLC, a mobile solutions specialist since 2003, has today introduced a new feature for codeREADr, their Android barcode scanning app for smartphones, which now reports device location in real time along with scanned and manually input data for tracking access, attendance, events and transactions of contractors, employees, students and assets. Enterprises can create an unlimited number of tracking and validation services and, when appropriate, add location tracking to record and post the physical location of each scan or entry made by the app user. 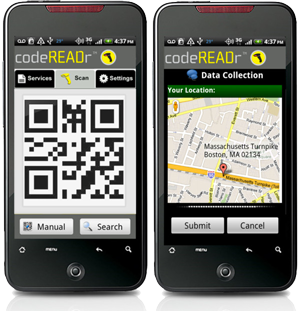 Location data is uploaded to codeREADr’s integrated web service along with the data embedded in the scanned barcode; the app user’s ID; the service ID; the unique device ID and any other data collected as the specific service is performed. Data is posted in real-time to codeREADr’s servers or stored on the device and later posted as a batch file. Administrators can review data directly from codeREADr’s web service or alternatively export or email it for further processing. An optional PostBack URL service is available for posting data directly from codeREADr’s severs to the administrator’s servers for processing, action and response. Open developer API’s are also available for third-party integration of the codeREADr platform. Location tracking requires positive affirmation from the app user by initiating tracking and confirming GPS or network location prior to posting data. The app user is issued sign-in credentials by the enterprise administrator, triggering the loading of only approved services for that user. “Our Android upgrade will be released for our Apple and BlackBerry codeREADr apps in Q3, 2011. Our roadmap also includes reading NFC tokens to complement our app’s scanning, search, data entry and location features,” said Rich Eicher, CEO, Skycore LLC.